Fine old Pacific Northwest Coast Kwakiutl Indian Ceremonial Dance Mask attributed to master carver Jack James (1902-1980). Attribution based on comparisons to known masks and we believe this mask to be from his earlier work, c. 1935. 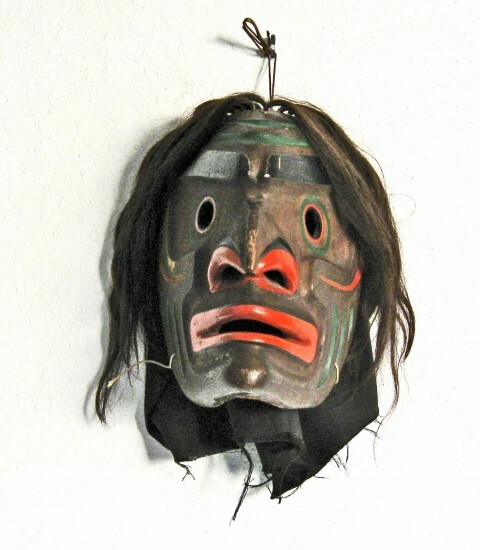 Jack James was a contemporary of Willie Seaweed, a very respected carver of masks. This mask represents Bookwus or Wild Man of the Woods. Reference – Art of the Kwakiutl Indians by Audrey Hawthorn, pgs 291-296 for similar examples. The mask is carved from red cedar and retains its dance rigging and original natural hair pegged into the mask. It is painted in its original pigments that have aged to s soft patina. It is in fine original condition with normal paint wear. The size is 13″ x 9″ and 8 1/2″ deep. Acquired from a Seattle, WA collection.